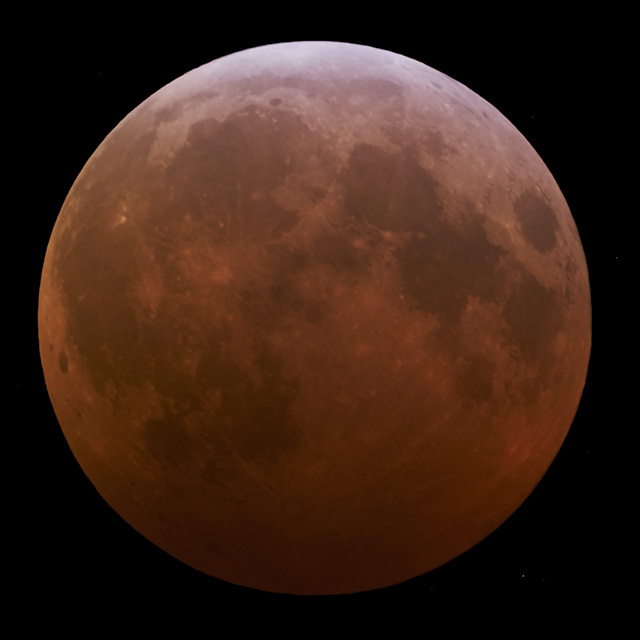 Deciding on a framing, exposure, and stacking plan for a lunar eclipse can be daunting. Once you have a plan, you may need to be prepared to improvise for weather conditions on the fly. You have the choice of shooting video, single still images, or image sequences intended for stacking. You may want to choose different techniques at different times during the eclipse. I took over a thousand images during the last eclipse. Here are examples of some of the choices I made and their results. The sky transparency varied during the eclipse, because of high ice clouds. These images were taken at different points during the eclipse, not ideal conditions. With them, you can compare different image stacking options during a lunar eclipse, under real world conditions. Take a multiple image burst with the same exposure settings. Later, evaluate the images to pick the highest quality "lucky" ones. This eliminates images that were distorted by poor atmospheric seeing. The good images are aligned and added together. This step reduces noise in the image. This results a cleaner image with a higher dynamic range. Single long exposures also reduce noise, but can be spoiled by momentary camera shake and bad seeing. Long exposure single images can also saturate bright elements of the image. Stacked images are not limited by sensor capacity, because the signal integration is done in software. Noise is reduced by the square root of total exposure time (or number of images stacked). 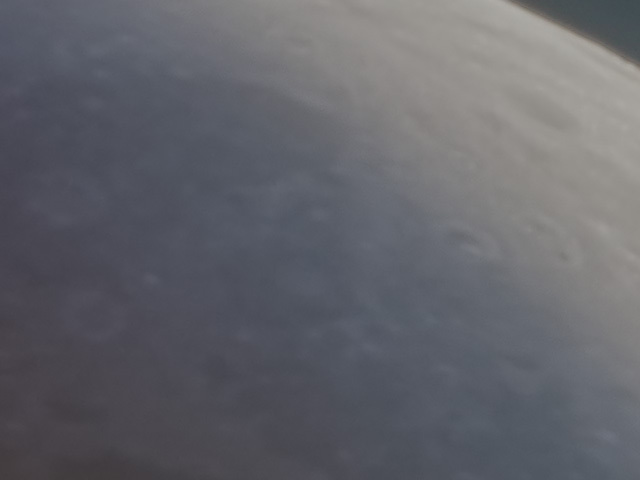 Full disk moon images can be difficult to stack because atmospheric seeing variations change the shape of the moon slightly from moment to moment just like waves distort underwater objects. 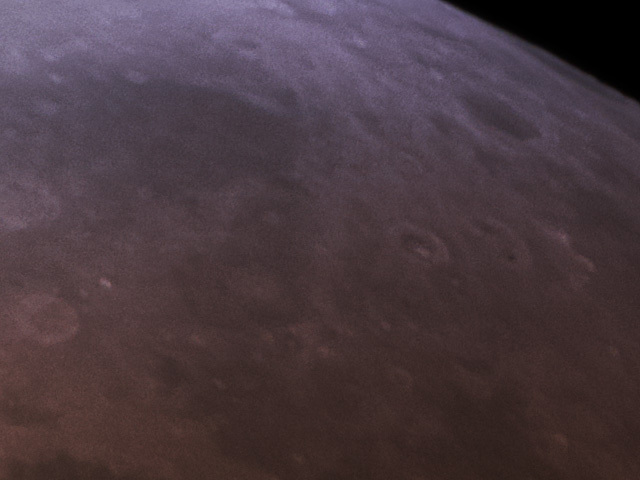 Unless seeing is very good, stacking full disk lunar images can produce blurrier results than the best single images. Some stacking programs produce better results by special techniques. Multiple alignment points or affine transform image optimization will correct individual stacked frames to produce a better result. 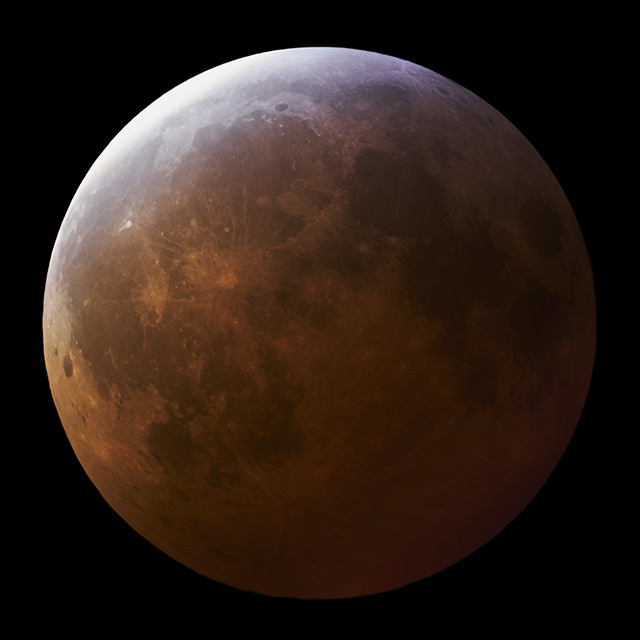 Low contrast images like those from totality in a lunar eclipse, make the problem harder. Sometimes one approach will work and other times another is best. I shot a few bursts of images at the same exposure setting during Sunday nights lunar eclipse, planning to produce clear low noise images of totality. Thin high ice clouds reduced transparency and resolution in my images. The increased noise and poorer resolution made these exposures especially valuable, but only if I could successfully stack them. I failed to produce useable results for this image in stacking attempts with Lynkeos and Autostakkert. Nebulosity's 8 parameter affine transform approach is much slower (overnight) but produced good results. I used the nine highest quality images. I was able to sharpen the images using deconvolution in Lynkeos and further sharpen and increase contrast in photoshop. Best 9 of 10 exposures stacked with affine transform optimization in Nebulosity, deconvolved in Lynkeos, with final sharpening and exposure adjustment in Photoshop. Exposed 10 sec at ISO 200 with a Questar 1350/89mm f/15 telescope and Sony a6300 at prime focus. This last image is an example of a single exposure image with only very light processing in Photoshop. A 30" exposure at ISO 400 taken 2019-01-21 at 05:17 UT. Cropped in Photoshop with minor sharpening and exposure adjustments. Questar f/15, 1350/89 mm telescope with Sony a6300 at prime focus. I didn't shoot any video with this eclipse. It has advantages, such as catching the meteorite impact that I missed between shots last weekend! Video frames are also great for lucky image stacking. There are also limitations to video. 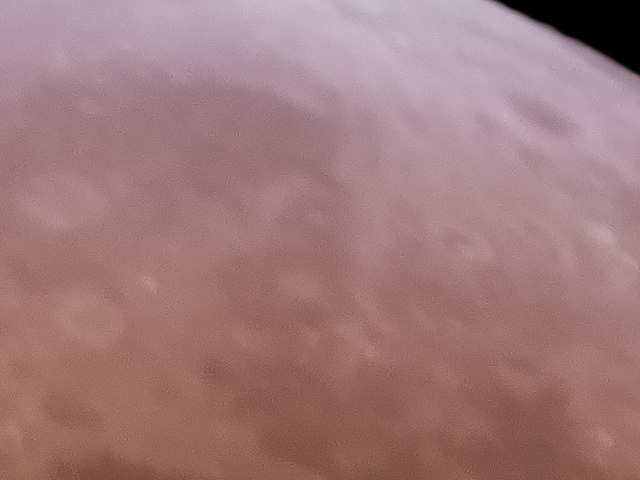 Video doesn't give the resolution possible with a still image camera under good seeing conditions with a telescope. With the latest 4k UHD video cameras, this is less of a disadvantage. Standard video codecs cannot capture your camera sensors dynamic range as well as raw format static images. If your camera supports one of the log video format recording options, it can capture detail over a wider dynamic range. The resulting video will need to be processed (graded) to look good. The final result will be superior to using the standard video encoding. Shooting image bursts for stacking is an effective technique to improve image quality. 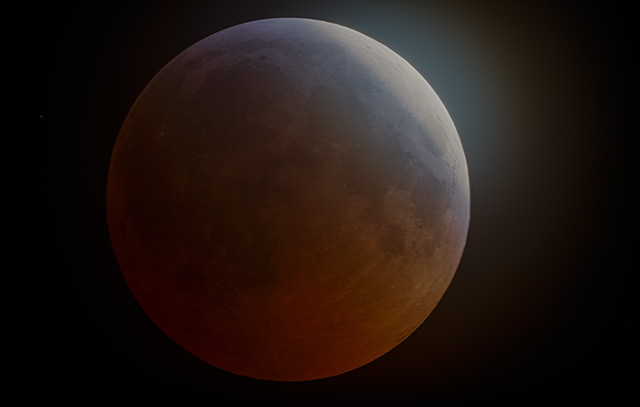 You can use a tethered control application like Lunar Eclipse Maestro. I used an intervalometer and my camera's preprogrammed bursts and HDR bracketing. Switching to HDR stacking during the times around totality, U2 and U3, worked well for me. Lucky image stacking of low contrast, fully eclipsed lunar disk images, can be difficult and time consuming. It is worthwhile because even a small number of stacked exposures reduces noise noticeably (9 exposures cut noise by 2/3, 4 exposures by 1/2). If images don't stack well you can always fall back to choosing the best image from the burst.